U.S. officials said on Thursday that the planned summit between U.S. President Donald Trump and North Korean Leader Kim Jong Un had been called off because a “successful outcome” did not seem possible. On Wednesday evening Washington time, North Korea had repeated a threat to pull out of the summit and warned it was prepared for a nuclear showdown with Washington if necessary. White House officials said that statement was “the last straw” given that the meeting was requested by North Korea. One senior official said there had been “a trail of broken promises” from North Korea. That included the North Koreans not showing up to a planned meeting in Singapore last week. 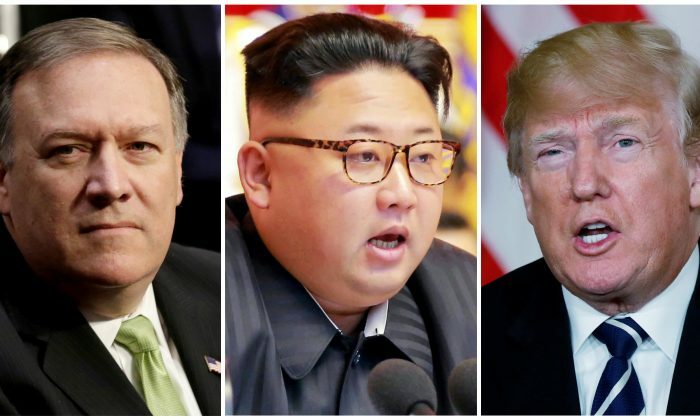 “Over the past many days, we have endeavored to do what Chairman Kim and I had agreed to put preparation teams together to begin to work for the summit and we had received no response to our inquiries to them,” U.S. Secretary of State Mike Pompeo told a Senate committee on Thursday. Pompeo, who met Kim twice in Pyongyang, said North Korea had also not been responding to contacts in recent days and Trump had made his decision after meetings on Wednesday to cancel the summit. Speaking at the White House, Trump said he remained open to dialogue and that the United States would continue its “maximum pressure” campaign of sanctions to press North Korea to give up its nuclear weapons. The outlook for the meeting soured dramatically this month when North Korea angrily backed away from the possibility of unilateral nuclear disarmament as had been agreed to in the April 27 Panmunjom Declaration with South Korea. Trump has said he detected a change in Kim’s attitude after the second of two recent visits the North Korean made to China and that he was possibly being influenced by Beijing, with which the United States is currently engaging in major trade discussions. David Kilgour, a former Edmonton MP and Canadian secretary of state for Asia Pacific, said that according to analysts, it seems that the party-state in China continues to play a lengthy smoke-and-mirrors game on North Korea, trapping the United States into pre-doomed negotiations. The cancellation came just hours after North Korea blew up tunnels at its main nuclear test site, but failed to allow experts to witness and verify the dismantlement of the site in another broken promise. Only a small group of international media handpicked by North Korea witnessed the demolition at the Punggye-ri site. North Korea’s announcement of its plan to destroy its only known nuclear test site was welcomed as a positive, if largely symbolic, step. Kim has declared his nuclear force complete, amid speculation the site was obsolete anyway. The Pentagon said it was too early to give an assessment, but U.S. officials and experts say the site could be put back into service or re-established elsewhere. Japanese Foreign Minister Taro Kono said Tokyo understands Trump’s decision to cancel the Singapore summit, Kyodo News reported. “It’s meaningless to have talks that don’t achieve results,” Kono told reporters on a visit to Mexico City, the news agency said. Japanese Defence Minister Itsunori Onodera also played down the significance of the canceled meeting. “The important thing is not the U.S.-North Korea meeting itself, but that the meeting becomes an opportunity to move forward in the issues of denuclearization and abductions,” he told reporters in Tokyo. A story of tragedy, faith, and resistance in the face of brutal totalitarianism, Memoir of a Communist Slave is one man’s journey to uncover what he believes has held him and his people hostage for too long.